Welcome to Part 2 of the 2015 Favorites series! This was a surprisingly difficult category for me to isolate my favorites. I tried a fair number of new face products this year but very few of them made what I would consider a lasting impression. Maybe I’m just getting old and difficult to impress. Or maybe there is such a thing as too many options. Just kidding, that’s plain crazy talk right there! So let’s take a look at a few of the face products that I loved this year! photo is from the Walgreens website…again…same as last year. Somehow I never manage to have any of this product on hand at the end of the year! I rarely wear foundation so most concealers tend to be too thick or full coverage and look a bit strange without foundation. The thing that I love about this pen is that it is a relatively sheer coverage and it brightens the undereye area without looking unnatural. It has the added benefit of being very affordable. image is from the Walmart website. I know. This powder is fantastic. It’s smooth, it isn’t cakey, and most importantly it is $4.00. FOUR DOLLARS. That’s great isn’t it?! I’m currently trying to work through several other powders that I have on hand before re-purchasing this powder but believe you me, I WILL be re-purchasing. Someday. If I ever use up all of the other powder in my collection. I do have a complete review of this product if you want more detailed information. I have to admit that I didn’t use this product quite as often this last year just because I had so many powder highlight products that demanded my attention. However, this stuff is still the bomb. It’s gorgeous and you can achieve a glow that ranges from “I just woke up like this” to “WHABAM! Highlight to light your way through the darkest of times!” It’s great. Swatches of the completely unattainable Fair Trade Coffee. This last Spring, Wet n’ Wild released a few Color Icon Blush and Glow Trios. Amongst this limited edition release (drat you limited edition madness!) a true gem was released and I found my favorite face highlight of all time. It’s perfect. It looks a little like Galadriel and a little like you’ve been standing out in the rain and now your skin is just glowing. I’m sorry if you didn’t get this. But if you DID, you should definitely be using it! All the time! However, if you DIDN’T get your hands on Fair Trade Coffee, allow me to suggest the Laura Geller highlight duo. This is a stunning highlight. The French Vanilla side gives a glowing subtle highlight and the Portofino side adds some shimmer and sparkle without heading into glitter territory. It’s really quite gorgeous! This is a VERY OLD photo but Monogamy is currently packed away…somewhere in the mountain of boxes in my house. Yay! Moving is fun! Oh Monogamy how I love you so! This blush you guys. It’s so good. It is a true neutral and it is subtle and lovely and I can’t tell you enough that you really need this blush in your life. I think that 2015 was sort of the Year of The Face Palette and the options for contour shades just exploded everywhere. But still, amidst all that chaos, Monogamy is my favorite go to contour. That compact has seen some things. I took it with me on vacation and the glass popped out and quite honestly, the poor thing may need to get depotted. Melba was absolutely my go-to blush this last year. It was a sneaky favorite though because I felt very ambivalent about this shade when I first purchased it and then I realised that I was grabbing this blush EVERY. SINGLE. DAY. It really goes with everything and if you are of the warm skin toned persuasion you may actually need this blush in your life. I have other blushes that I really enjoy but none of them are just perfect every single time. Melba, you da bomb! Favorite Overall Blush Formula: Milani Baked Blushes won and I still think that this is a fantastic formula but I just didn’t really feel like there was a single brand or formula that I gravitated towards in 2015. If you’re feeling the flashback vibes you can check out 2014 Favorite Face Products. 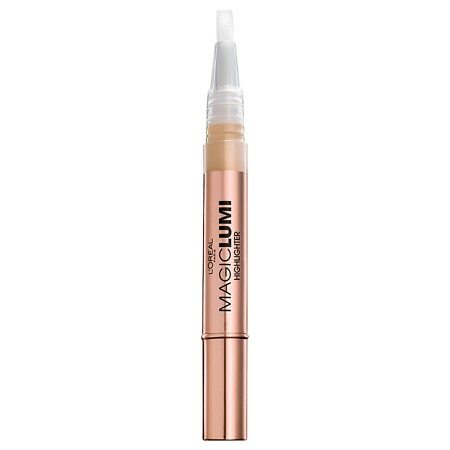 I like that L’Oreal Magic Lumi Highlighter too – have you ever tried the Maybelline Dream Lumi? It’s also good – makes me not care to ever try YSL Touche Eclat. Rimmel needs to repackage that powder better! Question: do you regularly contour your face? If so, what parts do you contour? I hardly ever contour… it’s that extra step that I just never bother to do. Ooh Maybelline Coral Burst blush is amazing! I snagged an unopened one through a blog sale and I’m SO pleased with it. If it was packaged in a MAC compact, I would totally pay $30 for that sucker. I like the Maybelline pen as well! It has a little better coverage which is sometimes really nice. I feel the same way though! The Touche Eclat seems a little over priced when there really are great cheaper versions. The powder packaging is THE WORST! Seriously! Rimmel kind of dropped the ball there. Yay another Coral Burst fan! Isn’t it so good? You’re super lucky to have found it in a blog sale! If Maybelline ever brings it back I am DEFINITELY buying a back up so I can stop hoarding it like a heavily made up Gollum. See I have high cheekbones and I don’t “need” to contour that area but I do want to try contouring my face a little. Usually when I ask the makeup artists to contour my face, they do my forehead (the temples) to make it look smaller (I got a fivehead). I usually just cover my face with my hair – problem solved, ta da!